Introverts may baulk at the new generation of hotels whose raison d’etre and design are specifically geared – from check-in and communal tables to food kiosks in the lobby – towards social interaction. That said, the new Düsseldorf outpost of the 25hours group is determined that its guests check-out are just that little more connected than when they first arrived. 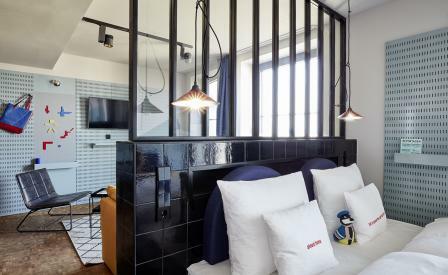 Located in the city’s new Le Quarter Central, a sprawling 360,000 square metre mini-metropolis in the former freight railway station, the 198-room property is the work of Swedish studio Stylt Trampoli, whose idea of ‘German engineering and French artistic flair’ is expressed in black steel staircases, a kitchen styled like a French country-house, timber parquet floors and four-poster beds in the bedrooms, and a reception inspired by the city’s electropop group Kraftwerk. The facilities are designed to pull guests out of their sun-lit, spacious rooms into the public areas. A flower shop stacked with age wooden crates stocks seasonal blooms; the gym is styled like a retro sports hall; and the mood of the 14th floor spa and sauna was apparently inspired by the Tour de France. Meanwhile, the neighbourhood is best explored on speedster bikes or a car, both rented through reception from Berlin-based bike specialists Schindelhauer and MINI.